COPENHAGEN — A street artist in Lithuania has adorned a barbecue restaurant with a poster showing Donald Trump locking lips with Vladimir Putin. 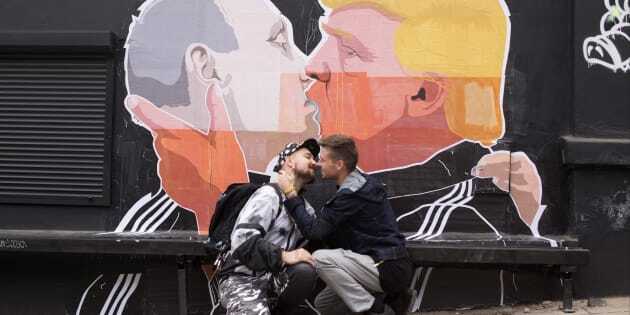 Ceckauskas said the poster was a nod to a 1979 photograph of Soviet leader Leonid Brezhnev kissing East German ally Erich Honecker on the mouth — once a customary greeting between Socialist leaders. The iconic shot was later painted on the Berlin Wall. There have been no calls to remove the more than 2-metre (6 1/2-foot) poster. "We think that the border now is not in Berlin, but somewhere here in the Baltic states, between (the) East and the West,'' he told The Associated Press. Lithuania — and its Baltic neighbours Estonia and Latvia — regained its independence in the early 1990's after nearly five decades under Soviet occupation and the 1991 Soviet collapse. More than a dozen people were killed and scores were injured in a Soviet crackdown on Lithuania's independence drive in January 1991.